I bet you have one. I don’t care how organized and OCD you are, some stuff is unorganizable. “A place for everything and everything in it’s place”, right? It’s not a personal observation or criticism, honest, it’s just that some things do NOT have a place. 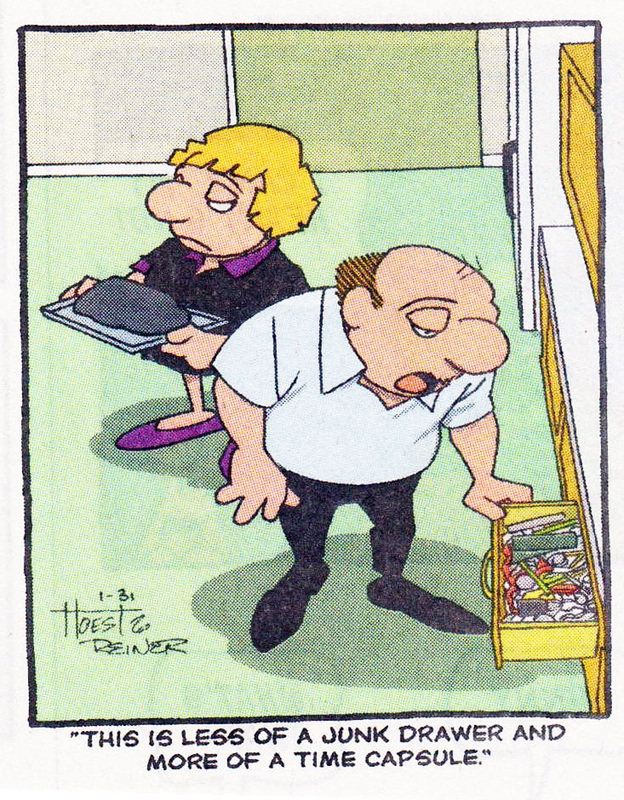 Well, that’s not completely true, they have a place… in the junk drawer. Maybe it’s in your office, or your buffet, or your end table, but probably in your kitchen. Some place where a general repository makes sense. A quick-clean counter-sweep catch-all. If you have a bunch of paper clips, they go in the paper clip holder. If you have one or two? In the junk drawer. The pens go in the pen jar, until the pen jar is full. The extras go in the junk drawer (and there always seem to be extras). Company coming and the scissors, coupons, and to-do list need to hide? Into the junk drawer! Same with that ChapStick, roll of tape, bouncy ball, and menu for that new Chinese place that delivers. You can tackle that drawer, vow to empty it. Dump it on the counter and categorize it. One pile for the bathroom, one pile for the bedroom, one for the office and one for the Kaboodle (which is basically just a portable junk drawer). The biggest pile goes in the trash can (expired coupons, ticket stubs, that nasty cough drop that is older than your youngest child), but then there’s the remainder… that goes back in the junk drawer. Where it belongs. Or, you can accept the inevitability of the junk drawer. The necessity of said designated space. The benefits of having an acceptable (and accepting) mess in your life. I’m just going to spell it out for you– Life is a junk drawer. A collection of the best (and worst), the important, unimportant, and tangible. You are the lone bolt searching for your matching nut amid the bent nails, miscellaneous screws, and various sizes of batteries in the junky drawer of life. The junk drawer is hopeful. The junk drawer is symbolic. 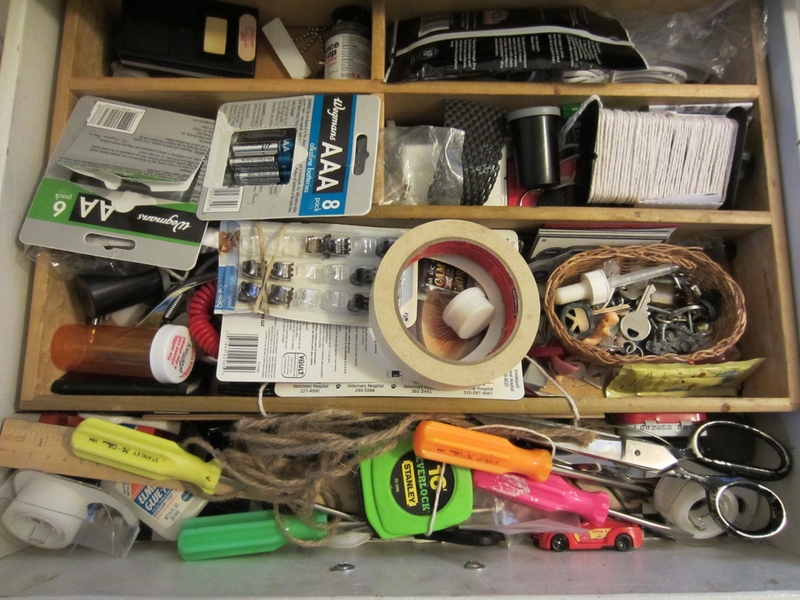 The junk drawer is as close to controlled chaos as you’re ever going to get. And that’s a good thing. We all need a safe place to be chaotic. And you know this to be true– regardless of the depth and quantity (and even chaos) of your junk drawer, you know what’s in there. You know to look in there because you know that’s where it should be. Where it belongs. In celebration of the junk drawer, in the comments below, please share the oddest thing in yours. Not mine, got this off the internet. This entry was posted in It's all about me, It's all about You and tagged "A place for everything and everything in it's place", controlled chaos, Junk drawer, Mary Lamphere. Bookmark the permalink.